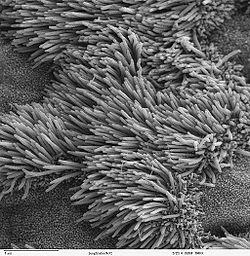 Scanning Electron Microscope image of lung trachea epithelium showing ciliated cells, and non-ciliated cells with microvilli. 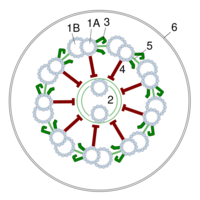 Cilia (singular cilium) is an organelle projecting from a eukaryotic cell. They are similar to the flagellum, a whip like tail found on some cells that usually helps in propulsion. Some kinds of Cilia can move and bend, others just float and seem to be used for sensors. Cilia, like mitochondria and the cell nucleus, are thought to be endosymbiotic or gained when a cell "eats" another organism which eventually takes up residence in the cell. Interestingly, in one study, cilia were singled out as not being possible to have originated in this way. Section of an axoneme "9+2"
1-A. and 1-B. tubulin dimers. 2. central pair of microtubules. 3. Dynein arms. 4. Radius. 5. Nexin. 6. Plasma membrane. A type of motor protein called the axonemal dynein powers cilia. The axoneme is the contractile structure of cilia and flagella formed by a ring of nine pairs of microtubules outside a central pair and associated proteins Dynein and Nexin. The Dynein is a massive molecular motor that transports various cellular cargo throughout the cell along microtubule tracks. The movement of these proteins provides the movement of cilia and flagella. The axoneme is the 'skeleton' of the appendages that line, for example, the lungs, and fallopian tubes. ↑ Behe, Michael J (2007). The Edge of Evolution: The Search for the Limits of Darwinism. New York: Free Press. p. 86. ISBN 978-0-7432-9622-9. ↑ Karp, Gerald (2008). Cell and Molecular Biology:Concepts and experiments (5th ed.). Hoboken, NJ: John Wiley & Sons. p. 349. ISBN 978-0-470-04217-5. ↑ Hartman, Hyman; Smith, Temple F (Abril 2009). "The evolution of the cilium and the eukaryotic cell". Cell Motility and the Cytoskeleton 66 (4): 215-219. ISSN 0886-1544. OCLC 38169885. http://www3.interscience.wiley.com/journal/122221668/abstract. ↑ 4.0 4.1 Sarfati, Jonathan (2008). By Design. Eight Mile Plains, Australia: Creation Book Publishers. p. 140-141. ISBN 978-0-94990672-4. ↑ Rana, Fazale (2008). The Cell´s Design: How Chemistry Reveals the Creator´s Artistry. Grand Rapids, Michigan: Baker Books. p. 83. ISBN 978-0-8010-6827-0. This page was last modified on 14 June 2013, at 12:26.